Everything lotus must be zen! 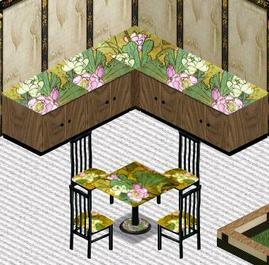 Click on the room views to download the Sims 1 Lotus Dining Set. Or download each object individually by clicking on each object shot. These Asian-style objects are all created by Expression (me!). Remember to read the description for Expansion Pack requirement and other awesome info! Is all the meditation making you hungry? Feed your stomach as well as your soul! The Lotus buffet randomly provides 5 elegant meals: lotus leaf sticky rice, lotus seed congee, lotus root and greens, lotus root and peanut soup, and lotus paste mooncake. Charges visitors for each meal so that your wallet won’t go hungry. Lotus Dishposal Bin Is anyone… ahem… I mean anything disturbing your quiet meditation? Let the Lotus Dishposal Bin restore your spiritual order! Connected to a mysterious black-hole, this all-powerful dishposal takes both trash and dishes and never needs emptying. It is so powerful that even the biggest trash-talkers will think twice before they trash anyone… I mean anything. Happy trashing! Machine-crafted in the tradition of the zen masters, this artificial lotus dining table is all you need to stay close to nature. Machine-crafted in the tradition of the zen masters, this artificial lotus dining chair is all you need to stay close to nature. Let the lotus illuminate your mind! Feel free to stare at it all day as the plastic petals ensure a soft glow for perfect meditative ambience. Machine-crafted in the tradition of the zen masters, this artificial lotus counter is all you need to stay close to nature. 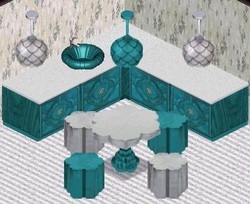 Wash your hands to purify your soul at the lotus sink basin! You can even reserve it for your “soul” use! Dish-washing disabled to avoid daily chores spoiling your zen moment. Lotus, the epitome of calmness. Set your heart pounding fast by falling in love with the Lotus dining room set. The low-quality laminate material will prevent your heart from catching on fire.